Local singer-songwriter John Hinton presents a compilation of songs from his several internationally successful science comedies. His Scientrilogy shows, in which he plays Charles Darwin, Albert Einstein and Marie Curie, have won awards at Edinburgh, Adelaide and Brighton Fringe Festivals, and at London’s Offies. 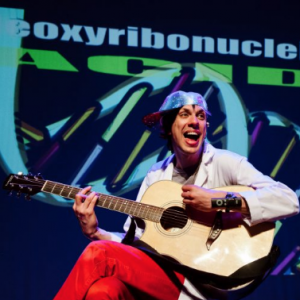 His two Ensonglopedia shows have taken Brighton Fringe by storm and taken alphabetical science songwriting to new heights. He has also written songs for the Natural History Museum, Cambridge University Botanic Garden, Eden Project and the National Railway Museum. Now that’s what I call a lot of songs about science, and today he hand-picks a selection of them just for you. Suitable for all ages, best enjoyed from age 7+. Science has never sounded so good.